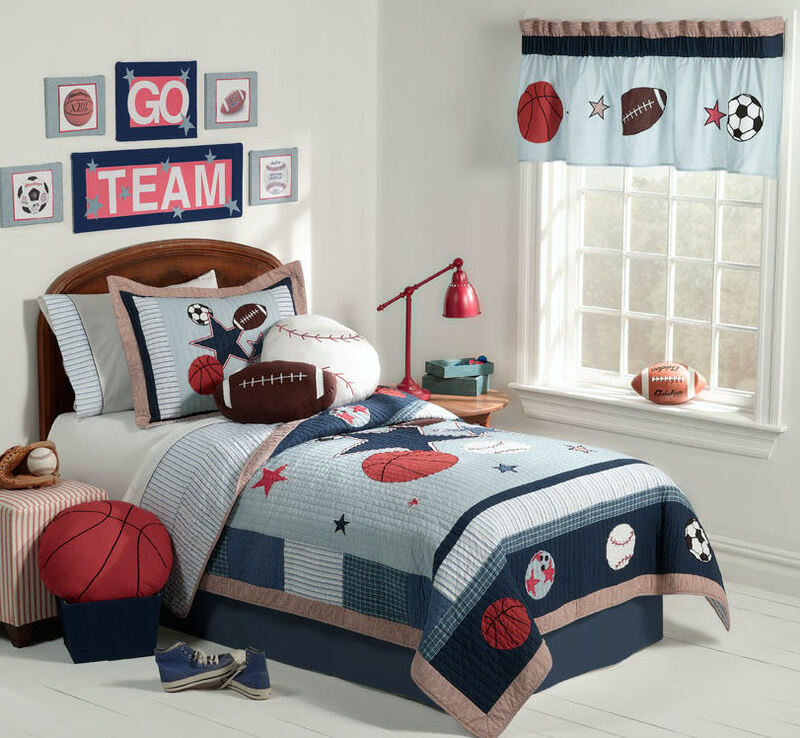 For boys bedroom, sport can be favorite theme. Most boys like sport. It’s perfect to decorate their bedroom with sport theme. It make them become sporty. 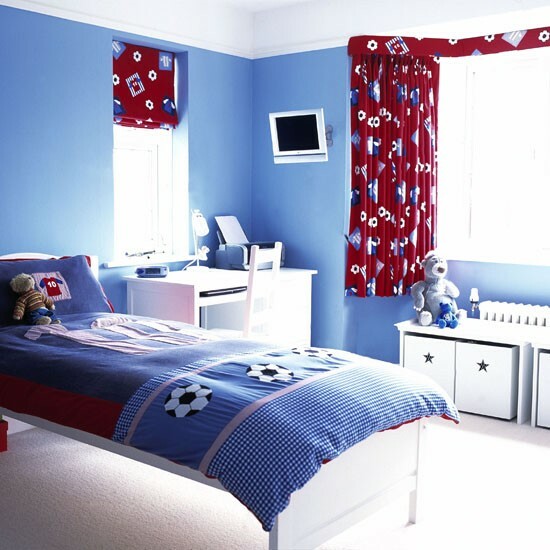 Seven sport themed bedrooms ideas we can try are: football, baseball, golf, boxing, martial art, skate board and racing car. These sports represent world of man. Starting from football. This is very popular sport on planet. Some football stars such as Christiano Ronaldo, Lionel Messi and David Becham are very popular for all of football fan, including for kids. Their picture can be installed on kids bedroom. It will inspire them become football star someday. Kids bedroom with football theme decoration can be applied by painting big ball on the wall, put some ball toys on bed, install bedding, blanket and pillow cover with football decoration. If install carpet, choose green color. It can represent green grass on stadium. Picture of football club logo is also good to be install on the wall. 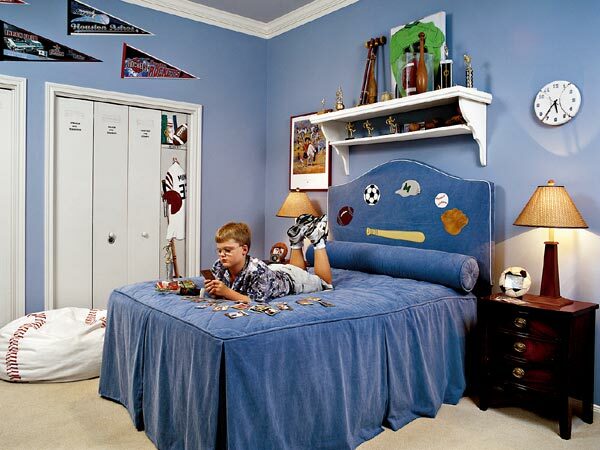 The next sport themed bedrooms idea is baseball. Here we can put soft sofa in baseball shape. Put one or two sofas with this shape near bed. Wall can be painted with person is playing this sport. It can be combined with picture of baseball stars and flag from favorite baseball club. If our boy like golf, we can install big green carpet on bedroom. This carpet represent green grass on gold field. Several golf sticks can be good decoration. Wall can be painted with situation gold playing. Picture of golf star such as Tiger Wood is good to be installed. If our boy like boxing, we can develop unique bed design for them. Their bed can surrounded by rope such as on boxing ring. So, this bed will be like a boxing ring. This decoration can be completed with soft sofa in boxing glove shape. It’s very unique. Other similar sport themed bedrooms is martial art. Here we can decorate bedding, blanket and pillow cover with martial art symbol, such as Karate, Jet Kun Do, Judo, Aikido, Kung Fu and so on. Picture of martial art stars like Bruce Lee, Jet Lee, Jacky Chan, Steven Seagal and Van Dame can be installed on the wall. The last sport are skateboard and racing car. This bedroom can be decorated with cabinet in curvature shape with a boy is playing skateboard picture as background. It will remind skateboard playing in real location. To apply racing car theme is by put bed in car shape. Our boys will love it. Let them think driving sport car like Michael Schumacher or Fernando Alonso. This is being categorized within sports themed bedroom for boys subject as well as sport theme subject plus sport themed bedrooms matter plus kids bedroom subject as well as sports themed rooms subject .